Maddie Slater sets the ball. NU opens its Big Ten season Wednesday against Indiana. In the eyes of coach Shane Davis, the Big Ten is the “gauntlet” of college volleyball. Davis hopes to begin the daunting conference schedule with a road win Wednesday at Indiana (11-2), which would provide an ideal start to the Wildcats’ (7-5) conference campaign. NU will play Big Ten games against eight of the current top 25 teams, including four top 10 foes. NU is coming off a 2-1 weekend at the University of Northern Iowa Tournament, while the Hoosiers just came off a 2-1 showing at the Hoosier Classic this weekend. Senior setter Caleigh Ryan, knows the importance of the team’s first game against conference competition. Both Ryan and Davis acknowledge NU’s struggles to close out sets and matches at times throughout the non-conference schedule. 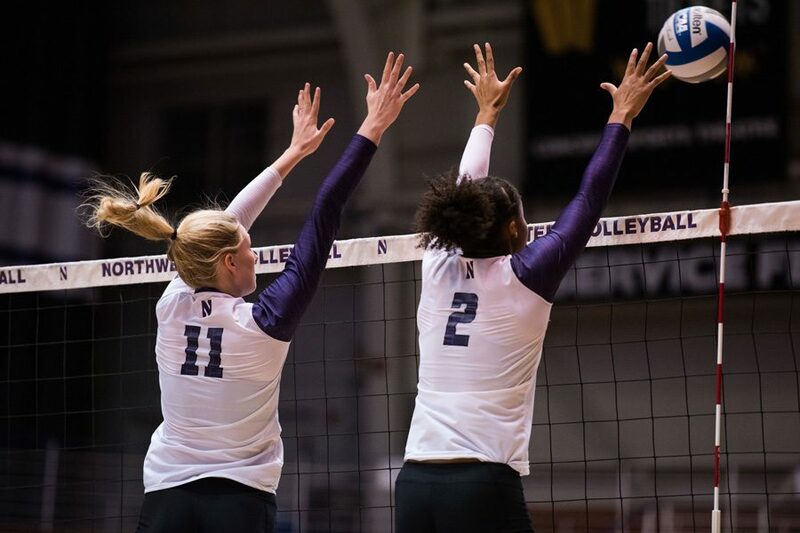 NU has lost leads in multiple matches, including in a 3-2 defeat to Ole Miss, a game in which the Cats led two sets to none before falling in five. One particular strength of the Cats is the offensive attack of junior Symone Abbott. The outside hitter holds the top spot in the Big Ten with 4.3 kills per set and is coming off a 46-kill, 37-dig weekend at the UNI Tournament. Davis recognizes Abbott’s growth as a player and said her play will be critical to the team’s success this season. Indiana has a dynamic attack of its own, led by middle blocker Jazzmine McDonald. She leads the conference with a .427 hitting percentage and the team ranks fourth in the Big Ten in that category. Eight of Indiana’s 11 wins have been 3-0 sweeps, and the team began the year with an impressive nine-match winning streak. Both teams will enter a grueling stretch following Wednesday’s match in Bloomington. NU will return home to take on perennial Big Ten power No. 18 Penn State in the home opener Sunday, and the Hoosiers will head to No. 10 Purdue. For now, though, the Cats know they must focus on the Hoosiers, who have won the two most recent matches against NU. Abbott, however, is confident in her team’s ability. “We play better against better teams,” she said. Davis, hoping for a road win to start conference play, is eager for his first chance at a Big Ten win as the Cats’ coach. He expects the Hoosiers to challenge NU.